The Swiss Ensemble Matka will travel from Lausanne, Switzerland, to Pittsburgh to present concerts of Iranian and Swiss contemporary music at the School of Music at Carnegie Mellon University. 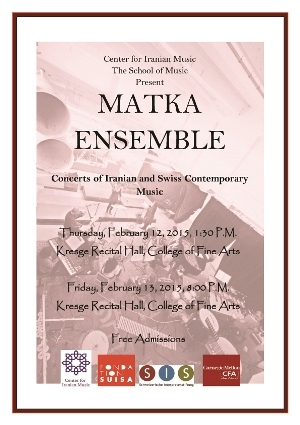 The Ensemble Matka will perform on Thursday, February 12, 2015 at 1:30 P.M., and on Friday, February 13, 2015 at 8:00 P.M. Both concerts are free admission and will take place at the Kresge Recital Hall, College of Fine Arts, Carnegie Mellon University. 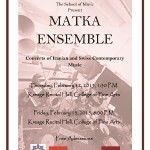 In addition, members of the Matka Ensemble will give a lecture at the Composers’ Forum on Friday, February 13, 2015 at 1:30 P.M. in room 157, College of Fine Arts, Carnegie Mellon University.